Greenpeace struck again ! 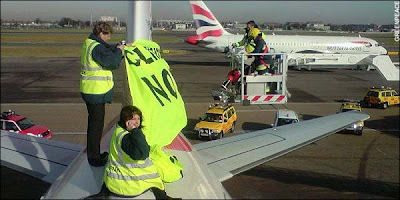 This past Monday February 25, 2008 three men and two women protesters climbed onto a British Airways flight at 9:45 a.m and covered the tail fin with a banner that read "Climate Emergency - No Third Runway." The protest came in light of Heathrow anticipated expansion plans of the airport. The organization is calling for an end to all airport expansion and a cap on flights at current levels. Although the protest did provide a global stage to discuss the climate change issues, most media outlets were more concerned with the security risks at the airport that would even allow for such an event to take place. Here is video coverage of the event and an interview with a protester, live - as the event happened...courtesy of CNN.